Nice. What about Novell or Microsoft directories? I acknowledge that Novell and Microsoft have both contributed to the directory services landscape in a big way. My intention on building this timeline, however, was to focus on stand-alone native LDAP servers. Novell and Microsoft have both been intentionally omitted as they could be considered more OS-based directory servers. I beg to differ. Novell has long had distributions of eDirectory as stand alone LDAP servers on many platforms, including, Solaris, IBM AIX, HP-UX, Linux and Windows since 1999. I have updated the diagram and timeline to recognize the UnboundID directory server. This was released in 2007 as a branch off of the OpenDS code base. – and don’t forget that at IBM, Lotus Domino had a Directory offering as well. I’m sure I am forgetting a bunch but my point is that the Directory space isn’t quite as inbred as this timeline suggests. Great post. What about Tivoli? and OID? You are off to a good start but have quite a ways to go. 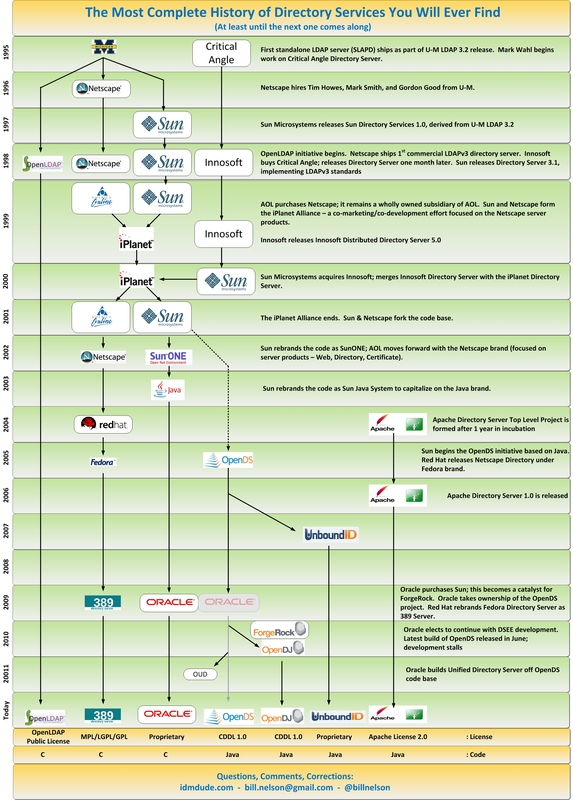 Like the Unix family tree, LDAP has quite an extensive history as well. I wish that I had time to incorporate some of the innovations introduced at each version but for now these version histories provide a good time line for their evolution. Lastly, there are other directory servers that you may want to graft into your DIT as well. Can’t be complete without Novell eDirectory. I know it started as an OS directory service, but it is also a fantastic LDAP directory, very easy to install and configure and the same directory install can be used as an LDAP or an OS directory service. Also can be installed on Windows, many flavours Unix and Linux. Your readers may be interested in the sequence of events that led to the development of LDAP, based around work on DIXIE and UMich and DASED at UCL/PSI. These developments are described in the following blog article. This history would be complete if it included Active Directoy as well. I have read many histories that seem to present AD then all the other LDAP vendors.